A Swag Code is a promotional code that the Swagucks posts on the blog, Facebook wall ,Twitter or other places. You then use the code to add a few points called SB to your account from the top menu bar. Normally the codes are active for only a certain amount of time. So, you won’t get every one, but you will get some of them if you keep an eye out. There are also Swag Codes for specific countries, though these are generally posted on the country specific facebook page or blog. One of the best place to check to see if there is a code out is the Swagbucks Facebook page. Users will often be posting “thanks you” or the actual code or link. The other places to easily find out about active codes is the browser extension, iPhone/Andorid app or certain forums that share Swag Codes. So now that you’re looking, you might want to know what a Swag Code looks like. Sometimes the codes are clearly labeled. Here’s an example from a Facebook post. Swag Code Alert! Enter NewShoes in the Swag Code box until 12PM PT/3PM ET to earn 2SB. In the above text the Swag Code is the part that has two words merged together. Swag Codes like there are made of up a few words merged together and never have a space in it. Most of the time the words are capitalized,but not always. While the URL where the Swag Code is located at can be shared, the Swag Code is only unique to your account and cannot be shared. Finally, sometimes the Swag Code is located at the end of a task or puzzle. Swagbucks will post on Facebook that a Swag Code can be found at the end of a certain task (generally watching videos or viewing certain webpages). To use the code checker on the toolbar you will need to install it first. (Please read the tutorial as it does change things in your browers settings!). Once installed you can simply click the “Check for Swag Code” button. If there is an active code it will tell you where to look to find the code or hint. Lastly, if you use the Swagbucks mobile app (for iPhone and Android mobile devices), there will be an alert that appears to tell you that there is an active code available. Once you know the code or where it is located, you can also add it to your account from the app as well for when you are on the go, or don’t have easy access to the Swagbucks home page. To add a Swag Code to your account, select the code and copy it (right click, copy or press Ctrl+ C). Make sure to avoid any spaces when copying the code. 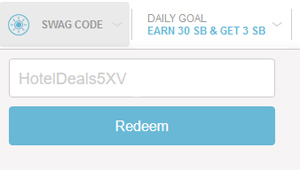 Next, go to the Swagbucks home page, although you can add it from almost any page. At the top of the pagenear the middle, there is a blue wheel icon and, on a larger screen, the text “Swag Code”. 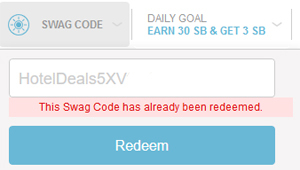 Hover/press on the “Swag Code” button/text and a box should appear directly below it. Either type or paste the code in the box that appears and then press the “Redeem” button to add the code! If it is correct, a blue bar should appear at the top stating that the code was successfully added to your account. On a mobile device, the swag code box may hide the notification, but if you do not see an error, it was successfully added. Below are the five different boxes that show up when you press “Redeem Swag Code”. If you still have a question after reading the page, check out the official Swag Code page from Swagbucks. This is what you want to see. There should be a blue bar across the top of the screen letting you know that it was successfully applied. (I used the mobile view so that I could easily screenshot the message). You are now one step closer to your goal! Congrats on successfully applying the Swag Code. This means that whatever you typed in was or is not a swag code. Remember that swag codes are case sensitive, so you’ll also get this message if you didn’t have it typed correctly or if you have a space at the beginning of the code. In that case, just delete the space. If you get this it means that the code was already used (and you got your points!). Normally you see this if you accidentally click the redeem button twice or if you try and use a code twice. Sorry to say but you missed the code. Remember codes are not always available for a long time. Better luck next time. If you happen to come across a Swag Code for a different county, it may say “This code is only active for Canada” or the country that it is for. Otherwise, when you try the code, you may see a similar message that it is for a different country. Since other countries can participate in Swagbucks, they try to make it possible for everyone to get Swag Codes.